It's still early, so you might not have heard the big news. It's a sad day for Hulkdom. After 81 issues over the course of five years, writer Greg Pak is stepping down from writing the adventures of everyone's favorite Green Goliath as of issue #635, likely shipping in late August. Counting his work on the regular title plus World War Hulk and its aftermath, Warbound, Skaar: Son of Hulk and its one-shots, and Giant-Size Hulk #1, he will be the second most tenured writer in Hulk history, between Peter David and Bill Mantlo. Talent maven C.B. Cebulski made the announcement during the "Marvel's Next Big Thing" panel at the Chicago Comics & Entertainment Expo, affectionately called "C2E2" by the popular media and its tens of thousands of attendees. Although Pak himself was not in attendance, soon afterward he appeared in interviews at Newsarama and Comic Book Resources, elaboring about his final storyline, "Heart of the Monster," beginning in June's issue #630. 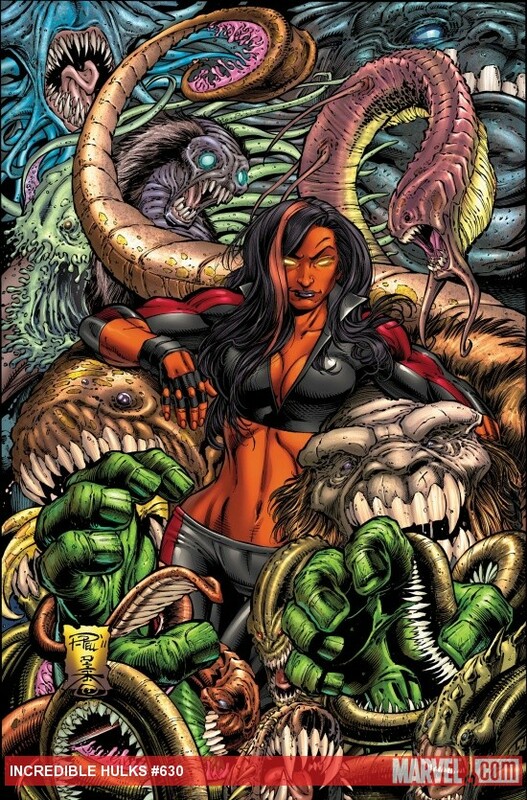 As seen in the above art by Paul Pelletier and Danny Miki, the Hulk will face opponents both varied and classic, like Wendigo (introduced in issue #162), Bi-Beast (#169), and Armageddon (#413) from his own corner of the Marvel Universe, plus Dr. Strange's foe Umar (who had an, ahem, interesting encounter with the Hulk during the 2005 Giffen/DeMatteis/Maguire Defenders miniseries) and an even bigger green monster than the Hulk: Fin Fang Foom (whom the Hulk did meet before, in the Hulk Vs. Fin Fang Foom one-shot). Then, of course, if you count Pelletier's cover for #630 (below) and the four interlocking covers (above), you'll notice there's still one more cover to be seen. Place your bets for the hidden mystery villain, if one exists, now. On top of these foes, the Hulk and Red She-Hulk will face one of the Hulk's oldest enemies, Tyrannus, in the arc immediately preceding "Heart," called "The Spy Who Smashed Me." Yes, it's an educated guess based on some inside information. (There's a slight spoiler there. Be careful!) Art for the penultimate arc is by Tom Grummett, an artist I've always wanted to see on the big green guy, so that makes it a must-buy. As if all of the above isn't enough, next week's Incredible Hulks #625 will mark another major status quo shift. It's the final issue titled in the plural, with the book returning to plain ol' Incredible Hulk in a few weeks. Pak teases there's a reason why Marvel's dropping the "s," and I'm betting it's got something to do with the departing Skaar and some other Warbound-related plot points. Stay tuned. How do I feel about Pak's impending departure? Well, quite honestly, I don't want to see him go, and thought we'd be in for many more years of interesting stories. (Certainly, I thought he'd at least make it to issue #650, which on the current schedule would ship around the Hulk's 50th anniversary.) That said, it's better to see a writer go out on his own terms, having said all he wanted to say about a character at this time. I've enjoyed the last five years of Hulk stories in ways I haven't known since around the period immediately following Heroes Reborn: The Return, with Banner and the Hulk having been re-merged during Peter David and Adam Kubert's waning days on the book. Pak has put together a storyline recalling the best elements of writers like Bill Mantlo, Peter David, and Stan Lee while bringing his own personal touches to the title. It's true, there are moments I haven't enjoyed quite so much, but the good moments greatly outnumber the bad. I haven't really reviewed Greg Pak's tenure on the book, aside from an in-depth commentary on World War Hulk some years ago, and segments on nearly every issue of The Incredible Hulk/s since "World War Hulks" began. I'm thinking that's going to change pretty soon, as I'd like to revisit "Planet Hulk," plus give some insights on Skaar: Son of Hulk, the "Banner & Son" misadventures by Pak & Ariel Olivetti, and "Fall of the Hulks." So, you can expect some in-depth entries about those issues in coming months ramping up to the grand finale. I'm also going to try to get some major surprises lined up for you folks. And you know I love to spring surprises. I'll say this in closing: Whoever takes over The Incredible Hulk in the wake of Greg Pak has his work cut out for him. He's leaving some Hulk-sized shoes to fill, and I don't envy that writer the task. Notice too I didn't say that other writer will "replace" him, as he's taken the Hulk to so many interesting new places and explored so many emotional angles that he's really proven himself in the upper echelon of Hulk writers in the modern era. There's only one Greg Pak, and he's leaving. Sure, we'll see him writing Herc, Alpha Flight and the Silver Surfer miniseries, and there's the promise of another announcement at San Francisco's Wondercon in a few weeks. And there are eleven more issues to go before the end arrives, which is five-and-a-half more months of Hulk Smashing. So in some ways it's still too early to say goodbye. So let's celebrate every bit of it, yeah? The man deserves it. It's sad to see Greg Pak leave the Incredible Hulk, for I was really hoping that he would stay around for a few more years. None the less, I really appreciate what he has give us in the last five years. Greg Pak has given us such great stories like: Planet Hulk, World War Hulk, Skaar: Son of Hulk, Fall of the Hulks, and World War Hulks. I just wish he was given more time and more issues regarding his less great Hulk story archs like: Dark Son Saga, Chaos War, and God Smash, for these storylines could have been executed a lot better. Regardless, I am thankful for Greg Pak, for he is the one who gave us Hulk at his best. I mean, he's the one who created the unstoppable World-Breaker Hulk! So, yes, it is very sad to see him leave. But maybe he'll return to the Hulk later down the road, much like Peter David did before him. You've also got a very big point in regards to the next writer, for they're going to have to fill some major Hulk sized shoes. The only one that comes to mind that could do it would have to be Jeff Parker. Needless to say, I'm hoping that Incredible Hulk: Heart of the Monster, goes out with a smash! And I'm talking something beyond world breaking, for I'm hoping it's universe smashing! Perhaps Greg Pak will write a new series with Skaar after the King of the Savage Land mini-series? One could only hope, but I honestly can't wait. It's just a shame that Greg Pak won't be working on a special issue for Hulk's 50th Anniversary... of course he still could and might. Thanks for keeping us informed, Gary. Let's hope that Pak really gives us something to talk about for his final arc. Gary,the link to your 'inside information' does not work. It says it can't find the page. If you have the time could you fix that? Zeno, it works for me just fine in three different browsers (IE, Chrome, Firefox). Must be something with your browser, buddy. Anyone else having issues? It's a tweet from Greg Pak that says "Fun writing 'TYRANNUS FLAME HEAD' as a character name." Gary I had read that on his twitter. There was even a bigger clue to Tyrannaus in the link to the cbr interview. He said the character in the story probably is the oldest surviving Hulk villain. Tyrannus goes back to issue 5. There have not any clues that he would bring back Gargoyle or General Fang. Actually the Ringmaster is the oldest surviving Hulk villain now that I think of it. Once again no evidence for him either. Gary,two questions for you. Do you know if they will reveal the origins of the Imperials and/or the Shadow people since the Planet Hulk guidebook says neither of them came from Skaar. The only ones who are natives are Miek's hive. Is there another femme fatale besides Umar? Perhaps his college girlfriend Monica Rappucini? Or even Breett from Mantlo's. Pak loves Mantlo's stuff and the Moench Rampaging Hulk though not in continuity did take place in Rome in it's first issue. Ah. I was wondering when you were going to comment on this sad news. I was also disappointed to hear that Greg Pak was leaving, but I'm thrilled we got five years' worth of epic stories out of him. And he is leaving in a way that will allow him to nicely wrap things up and give his Hulk run a "grand finale" of sorts.